You don’t have to be a kid to benefit from a few glasses of milk each day. In fact, adults can benefit quite nicely. In general, milk is known for abetting strong teeth and bones, good skin, immune system support and the prevention of dental decay, hypertension, respiratory problems, some forms of cancer and other illnesses. And now, it helps to reduce heart disease. A study published recently in the American Journal of Clinical Nutrition found that three glasses of milk per day may lead to an 18% decreased risk of cardiovascular disease. While some people steer clear of milk because of the saturated fat, the researchers, from Harvard University and Wageningen University in The Netherlands, found no link between the consumption of regular or low-fat dairy and any increased risk of heart disease, stroke or total mortality. That doesn’t mean you should embrace the calories and fat of whole milk. 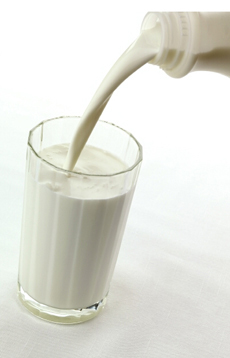 Switch whole milk for 2% lowfat milk and wean your way down to 1% and 0% fat. Photo courtesy Wisconsin Milk Marketing Board. Try Superpremium Milk. We love the “superpremium” fat free milk that removes some of the natural water content. It concentrates the milk flavor so that 0% tastes like 2%. It’s well worth the extra money. Go Lactose-Free. There are plenty of lactose-free milk options for sensitive people. THE NIBBLE office has only lactose-free milk and soymilk in our office. Lactose-free milk tastes exactly like conventional milk and is available in lowfat and nonfat versions. Consider Organic Milk. One of the best-selling organic products is milk, since conventional herds can be injected with the growth hormone rBGH/rBST. You can even find milk that’s organic and lactose-free. Organic Valley makes certified organic Fat Free/Skim Lactose Free Milk and 1% Lactose Free Milk. There’s a $1.00 coupon on the website. Fill a mug with nonfat milk and heat it in the microwave. Time will vary based on milk temperature, so start with 60 seconds for cold milk and see what works best in your microwave. Remove mug from microwave and stir in a packet of noncaloric sweetener or a bit of agave nectar. You can play around with spices (cinnamon and nutmeg work well) or extracts (a bit of vanilla or banana, for example; or stir in a piece of mashed banana). Milk it for all it’s worth.